pattern and fabric by the very talented Anna Maria Horner! The quilt was a pleasure to piece! This is the baby size...measuring about 36 X 50 inches. and it is backed in a single cut from the Field Study line.. It is a great quilt...give it a try! While I was putting in the last stitches on the binding, my mailman dropped a package in my mail box...ohhhhh....exciting! I participated in the Modern Quilted Pillow Swap and my secret swap arrived! Look how pretty it is on my bed with my other pillows! Thank you, thank you, Svetlana! You made my day! Beautiful!! This is one I've been debating making for my sister-in-law for Christmas. It's very much her style - I just need to find the time! Mary you are lucky indeed! Svetlana is so talented- just like you. Love your hand quilting on the feathers quilt. The whole thing is lovely! PS: Been enjoying your wedding boards on Pinterest! Fun times! Oh Boy! This is a great quilt, the hand quilting just puts it over the top, I love it! Lucky you, that pillow and pincushion are really cute. Gorgeous quilt as usual! You gave me a great idea. I'm planning a quilt for my son for when he moves into a big bed. I was going to do white for the background but now I think I may try essex linen (white doesn't sound like a good idea for a messy little boy). I don't usually wash my fabrics first but I was wondering since it wasn't 100 percent cotton if I would have to wash them all. Is there anything else I should know making a quilt with linen versus cotton? Your gifts are incredible and inspiring as well. Feather Bed is just gorgeous! I just cut my fat quarters in half to share with Deborah (Simply Miss Luella). I'm not sure what she is going to do with her, but I'm definitely making Feather Bed. Your stitching is beautiful. And Svetlana--I'm so glad her pillow went to you. You are both so creative and inspirational. I adore you both. I just read about Svetlana's cushion today!! It's so beautiful! I adore your feather quilt Mary! The backing is so perfect and the feathers just make me smile so much! I volunteered for the Native American Rights Fund in Boulder, Co. (we used to spend summers there) and their logo is a feather. Very beautiful! Your work provides me with so much inspiration and beauty, thank you! wow, the feather quilt is amazing, just fabulous! Oh wow - your quilt is just lovely. Truly a work of art! Mary, I love your hand quilting! When you wash and dry your quilts, what settings do you use? Or do you hand wash and air dry? Love your feather quilt! 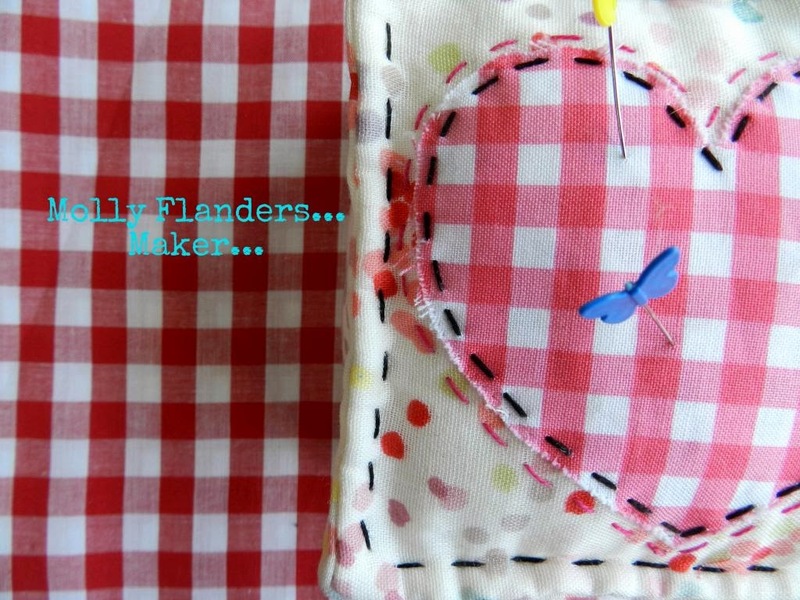 It's inspiring me to make one - I do also love your hand quilting! The quilt is beautiful. Love your handquilting in Perle thread. Really adds texture to the quilt. The cushions are beautiful too. Hi Melly! I hope you find my answer here. I wash in the machine with cold water and dry on a low setting. Easy Peasy! wow, what a trio of beautiful makes! I just love your quilt and your beautiful hand quilting! Gorgeous! I love your feather quilt. It is inspiring me to get mine started sooner than planned. I figured I would get to it sooner or later. But now I am rethinking that. It's probably all been said... Your feathers are stunning! ( I am definitely making this, all WIPs will be tossed aside! ) And I love Svetlanas pillow- another beauty claimed! So much yummiest in one post!!! The feathers are beautiful!! I love that backing fabric too!! Your cushion is so gorgeous and the pin cushion is the cutest little pinnie. Goodness this is beautiful! I love the handwork, it makes it perfect! Lovely pillow too, lucky you!! Everything about your Feather Bed is gorgeous Mary! Love it a lot!! Love the quilt and the hexie pillow! Oh beautiful cuddly quilt! What batting did you use in this one? Love, love the cushion, it plays nicely with your collection too. How cute is that pincushion? Oh my! And I am a happy camper just admiring all of the eye candy and inspiration today on your blog, Mary! I'm heading over to check out Svetlana's blog now! I know I'm going to love it! What a gorgeous quilt! I am dying to make it, but not till I get some other things finished up. Your feather quilt came out beautiful! I love that fabric on the back. Isn't that pillow pretty! Lucy girl! Your feather quilt is so pretty! Great job. It looks so crunkly and cuddly. LOVE the pillows from Svetlana! your quilt is amazing! that essex linen, wow! it already looks like an heirloom. and how lucky that you received Svetlana's pillow. I love her work! Mary, your feather quilt is simply stunning. I love all the fabrics you chose, and the background essex is so perfect. Thank you for saying such nice things about the pillow, too. I'm really glad you like it. It looks right at home with your other pillows. yay! So beautiful your feather quilt! I think any baby would be pleased to get it though I'm not sure it would be passed on by the mum! Svetlana is awesome - bet she was thrilled to be making for you Mary! The quilt looks stunning, I am so drawn to that pattern too. And you got such a beautiful pillow in the swap. What a nice swap pillow! Love your feathers quilt - and the stitching is so beautiful. Your feathers quilt is beautiful and that is one of my all time favs on the backing. Love the look of the linen and the backing materials! Beautiful quilt. I love those feathers! And lucky you with that pillow!